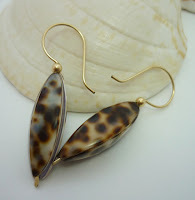 MiShel Designs: Style Envy LOVES Our Animal Print Shell Bead Earrings!! Style Envy LOVES Our Animal Print Shell Bead Earrings!! We're sending a big THANK YOU over to our friends at Style Envy!! They're loving our Animal Print Shell Bead Earrings in 14K gold fill and we're loving them for it!! Style Envy has all your designer needs in one place - fashion, jewelry, accessories - and they've got it all for LESS!! That's right - find the greatest deals and steals in they Style Specials section! Shop early for your holiday needs and save BIG!! Peace, Love and Style Envy, Baby! !